You want bubbles? You got it! Get ready for this little beauty. 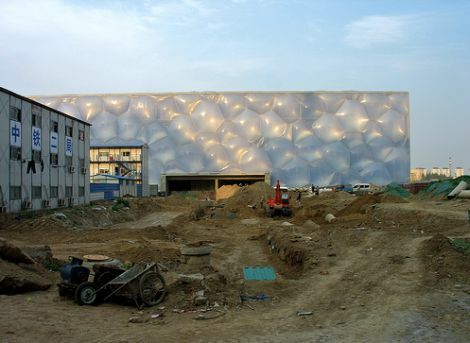 Beijing is building an aquatic center for the 2008 Olympic Games...with the outside facade being a little bubbly. This is pretty crazy! Designed by PTW Architects in Australia, it was the engineers who took off with the idea of bubbles and made it a reality. 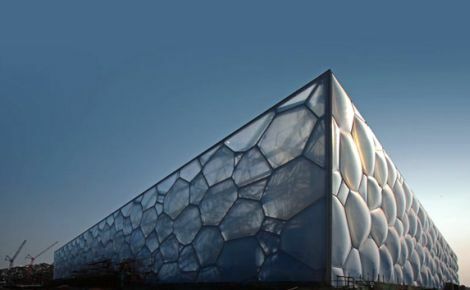 By using computer programs and complex algorithms, they figured out how to apply the idea of a bubble looking surface to an actual building. 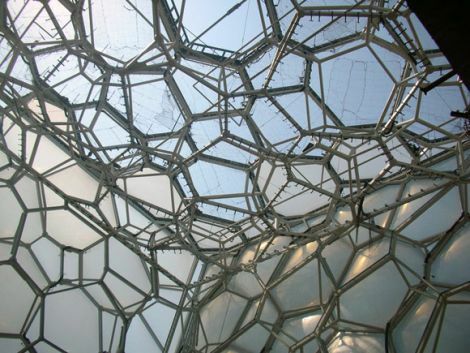 Once they figured out how the steel frames and connectors were to be used in forming the bubble structure, two layers of plastic film called ETFE (Ethylene TetraFluoroEthylene) were used to fill in the spaces between the steel frames. ETFE is very thin and very durable. Air was inserted between the two layers of plastic, which inflate and create the pillow look. 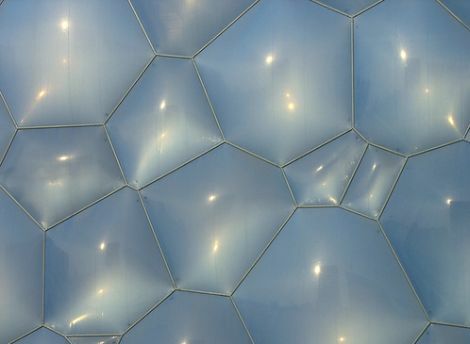 Both the interior and exterior of the walls and roof have the ETFE cladding, which basically creates a greenhouse out of the Water Cube. If the building needs to be warmed, warm air from the walls is circulated into the building. If the building needs to be cooled (which can happen during swim meets...if you have ever been inside during one, it gets really stuffy), air is pulled up from the ground level and pushed through the roof. The cool thing about the ETFE cladding is that it allows more light and heat penetration than glass, translating into a 30% decrease in energy costs! The structure itself is based on unique, lightweight construction, which makes it eco- and earthquake-friendly. Unique, innovative, creative, different and green. Kudos to Tim McKeough over at Wired who broke the story. That’s a very beautiful aquatic center. I wonder how Beijing came up with that idea. The style and the architecture design are beautiful. Your so talented. That bubble wall looks squeaky. I love to touch them as mush as I could. Would they burst if i do that? lol Thanks for posting I love it. Your talent is exceptional. Keep it up! Your blog is so very nice and what you write and the style you demonstrate. Thank you. I do believe that. It's not just your typical building structure.